Looks good but 40% will go to waste. The United Nations recently declared a Zero Hunger challenge, inviting “all countries to work towards a future where every individual has adequate nutrition and where all food systems are resilient.” Being hungry – truly hungry – is something that I’ve never experienced. The same is likely also true for most people reading this post. Sure there are several instances where I’ve ignorantly stated that I’m ‘starving’ but in my world of plenty, I’m more concerned about over-eating than not having enough. This over-abundance has led to an incredible amount of wasting. Some estimates suggest that 40% of all edible food is wasted. The average American throws away about 20 pounds of food each month – amounting to a monthly cost of $28-43. With 17.2 million households in America deemed to be “food insecure” why should any food go to waste? I have to wonder – with 34 million tonnes of food waste generated annually in the US – how much could have been salvaged to feed hungry people? Hitting the dumpster diving jackpot! Grapes, green peppers, apples and canned goods. 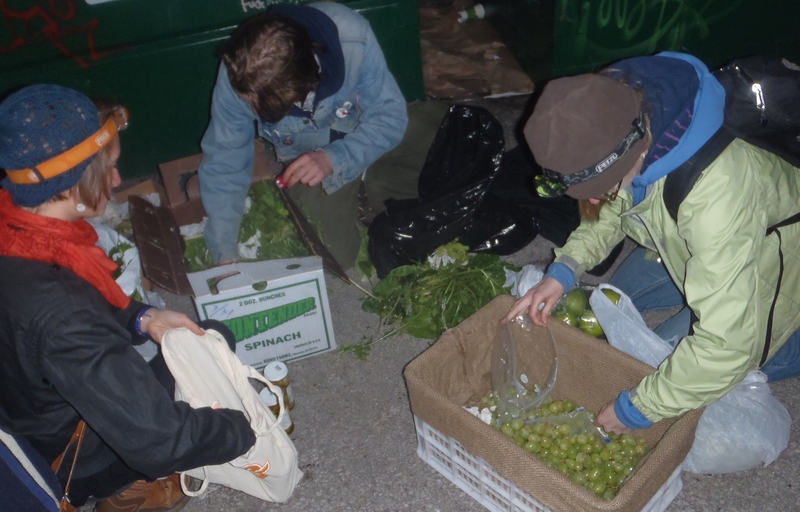 Last year I tagged along with a Toronto dumpster diving crew and was astounded to see how much food we recovered from a local supermarket dumpster. Some of it was still packaged! The Food Not Bombs crew I was with noted that bigger supermarket chains were the real jackpot but those dumpsters were often locked away – preventing divers from getting in. Many food items are thrown away not because they’ve gone bad but because packaging is damaged or it doesn’t look picture perfect. I don’t know about you but my stomach has never complained about a funny looking carrot! The problems associated with food waste extend beyond hunger as the mass production of food is resource intensive and can be environmentally destructive. Within the US, 25% of all freshwater used and 4% of oil consumed was used to produce food that was never eaten. In addition to the 34 million tonnes of food collected in municipalities, American agricultural waste is estimated to be in the billions of tonnes (p. 185). This waste includes toxic agricultural pesticides that are detrimental to human and environmental health. For starters, shop smarter – buy only what you need! Secondly, use what you have! I have many memories of my Grandma putting together (sometimes questionable!) mixed up leftovers for Sunday night dinners. Although I’m not yet an expert at creative meals, I did inherit my Grandma’s disregard for expiry dates. If it smells okay, it’s okay to me! (Thankfully I haven’t experienced any repercussions yet). Preserving food is another lost art – put that extra soup in the freezer for a quick meal some other time or maybe learn how to can your vegetables and fruits. And lastly, if you can’t use it maybe someone else can. Check to see if your community has a food share program where you can donate both non-perishable and perishable foods – Food Not Bombs, Second Harvest and Food Runners are just some examples. I’d love to hear more suggestions! So this Sunday, give yourself a challenge – take a creative look in your fridge to see what you could throw together in a pan or pot rather than a bin. For inspiration check out LeftOverChef. Tags: dumpster diving, food, food waste, leftovers, zero hunger. Bookmark the permalink.